Dairy farmers in New Zealand have been left unable to milk their cows following an earthquake on Monday. Many farmers have been left without power but are choosing not to use back-up generators which run on water as they need to conserve it for stock. 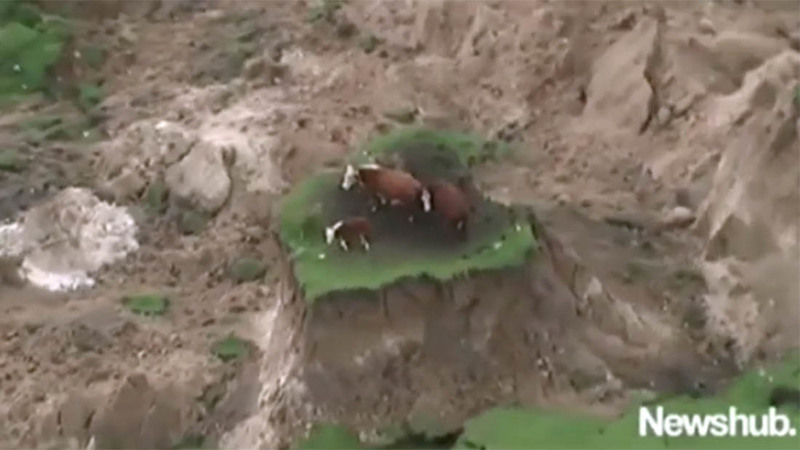 Pictures of two cows and a calf marooned on an island created by the quake went viral on social media before the farmer could rescue them. Miles Hurrell, farm source chief operating officer at Fonterra dairy co-operative, said: "We are extremely relieved to confirm there are no injuries to any of our staff around the country and our focus continues to be making sure we can contact and support as many of our farmers in affected areas as we can." However, Mr Hurrell said some farms which remain without power or cannot be reached may have to dispose of their milk. 30 farms in Kaikoura may not have their milk collected and others may have late collections due to road closures. "We are doing our best to reach everyone who is due for collection immediately. "With power out and phone lines down in some areas, that includes putting Farm Source teams on the road to go door to door to try to update those farmers with the latest information." Chief operating officer for global operations, Robert Spurway said most of their manufacturing sites were fully operational. "This has been a frightening event for many of our communities and our thoughts are with those who are suffering losses."